A Connecticut man was taken into custody after shooting his wife and two police officers in the couple’s New Haven, CT residence Saturday. 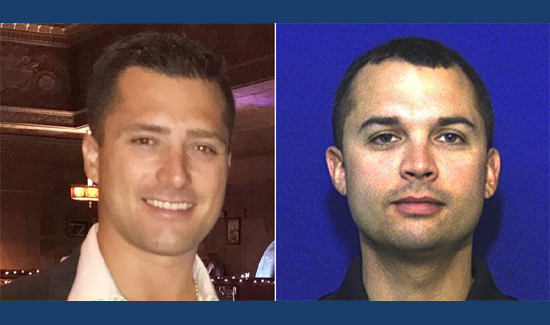 Officers Eric Pessino and Scott Shumway (above) responded to a home on Elm Street at around 10:30 a.m. where they found a woman shot in the hand, arms, back and chest. Police said that the female victim, 51, was shot at home by her husband, John Douglas Monroe, before she fled to a neighbor’s house across the street. Monroe, 51, was taken into custody Saturday afternoon. The officers first responded to the neighbor’s house and arranged for the victim, a retired Corrections Department employee, to be taken to the hospital. They then tried to enter the victim’s residence, and were shot upon passing through the front door. Both officers were shot in the arm and sustained non-life threatening injuries. Officials said the gunman was holed up in the victim’s home on Elm Street at Sherman Avenue. Police set up a perimeter around the area. SWAT teams and hostage negotiators were at the scene Saturday afternoon, as the suspect moved to the home’s basement. Officers met Monroe at the basement door and opened fire on the suspect, striking him before they arrested him. The victim remains in critical condition at Yale New Haven hospital.Officer Pessino has been released from the hospital while officer Shumway remains hospitalized.